Special thanks to my old teacher, Mr Arickx, who kindely traded some of his amazing honey for some of my homebrew. 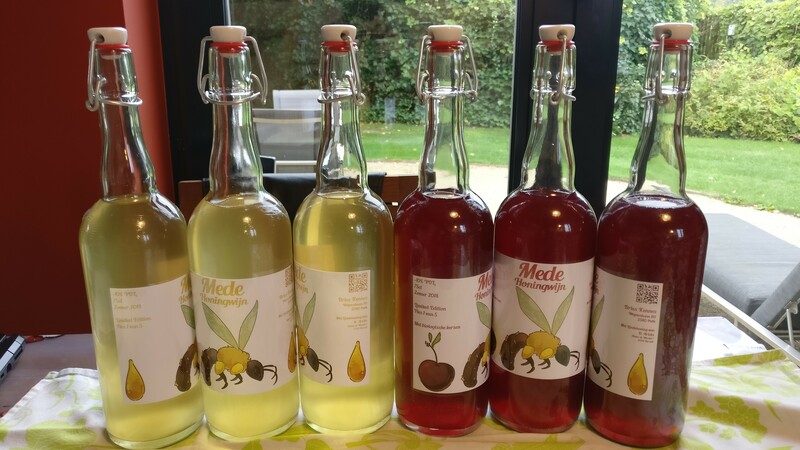 Today I made my first (and also imidiately second) mead! I've never actually had mead, so I hope I like it :smile:! I used 2 different recipes, with 2 different yeasts. 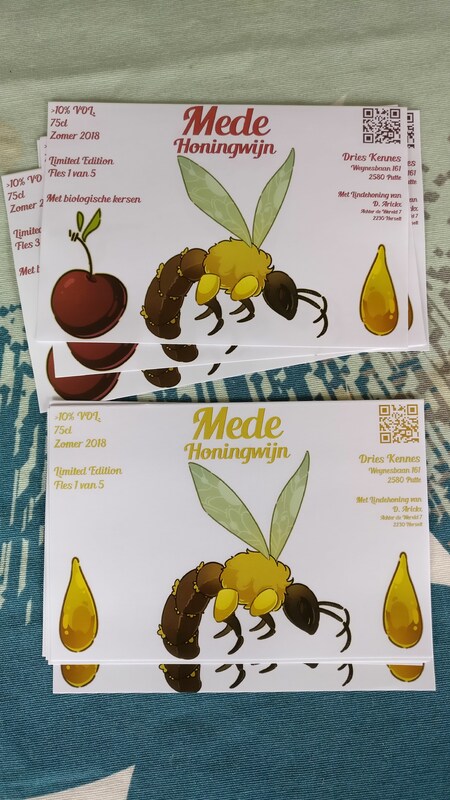 I did not plan on making a cherry mead, originally it was going to be one batch of JOAM and one of BOMM ("Bray’s One Month Mead"). Then my grandparents stopped by to drop of a load of cherries they helped an uncle pluck. The cherries where quite ripe, so they had to be uses as soon as possible. 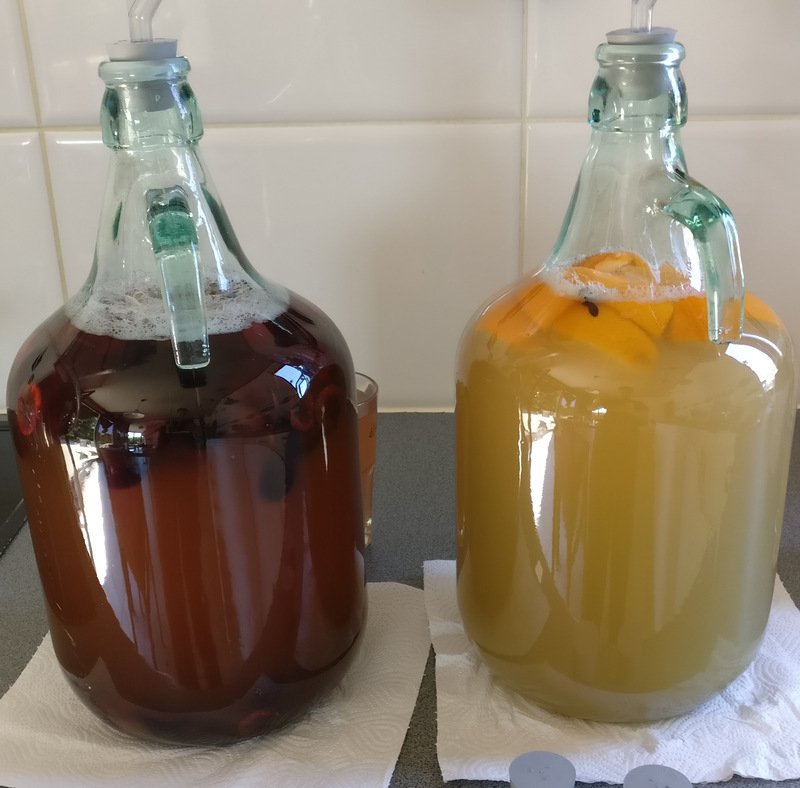 So I decided to brew on friday (29 jun) instead of saturday and use the cherries in the mead. Since the BOMM recipe doesn't have any special ingredients and even has the suggestion of fruit, it thought it would be most appropriate to use that recipe. The honey used was 2.5kg of lime blossom honey (very potent smell and taste, good stuff), desolved in 8l of slightly warmed up (35°C) water. I should have used less water, because I ended up with leftovers that didn't fit in the carboys. (I added the leftovers to some fruit and Cava to make a sparkling Sangria, not bad.) This was the base used for both of the batches. Starting gravity: 1.074. I also added the maximal dose (6g/10l) of Vinoferm nutrisal (Brouwland). I decided to remove the pits/stones from the fruits and I'm glad I did. This allowed me to filter out fruits too far gone and remove some of the extra included protein (the cherries where very bio and had a bit of a worm problem). I added the fruit directly to the carboy and added the honey-water on top. When it cooled down to approx outside temperatures (27°C) I added a full pack of Wyeast 1388 "Strong Belgian Ale". This carboy was slower to start, but had a more vigorous fermentation going a few hours later. This is an adapted version of the "Joe's Ancient Orange Mead - JOAM" recipe. The origianal recipe, converted to metric, lives here. to the carboy and added the honey-water. The yeast used was "Mangrove Jack's" M05. 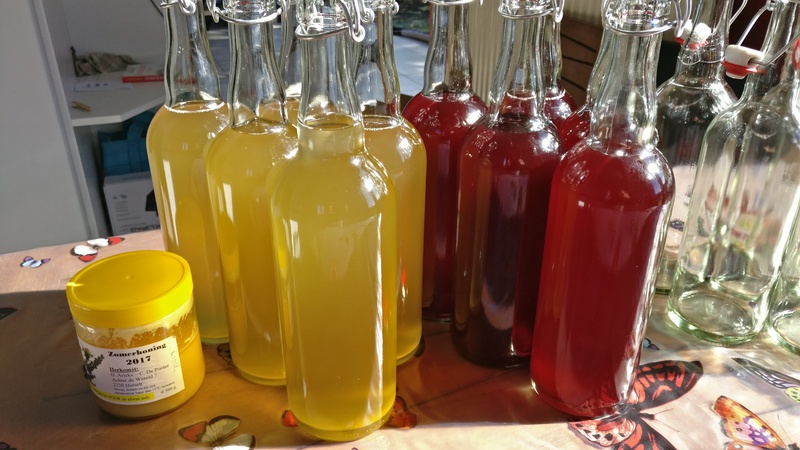 I finally bottled the mead! The 5L batches turned into 5 75cl bottles, which was about the expected yield. I'm glad I got the clear re-closable bottles. It looks a lot better than it would have in brown ones and you don't have to drink it all in one go. It tastes great already, nice and crisp. The cherry mead is sweater with a quite noticeable but not overpowering cherry taste. The classic yellow mead has a nice orange smell and aftertaste. Both are sweater than I would have imagined reading the gravity. I have never had any other mead, so I don't have a reference to say if it tastes like mead should. But I like it! Speaking of gravity, my beer hydrometer isn't quite up to the task. It only goes to 1.000, and in this mead it still doesn't float. That means my mead is at least 10% VOL. Note to self: Buy a wine hydrometer and a longer graduated cylinder. I'm going to leave the bottles in the garage for a few more days (at room temperature) and then move them to the bunker. I'm wondering if it will pick up any carbonation. I didn't add any more sugar/honey, but I think the movement from the botteling caused some activity because the sample I tasted was a bit sparkling. The label artwork is a commission done by Maliveth.